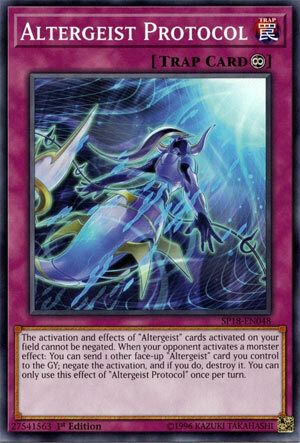 The activation and effects of “Altergeist” cards activated on your field cannot be negated. When your opponent activates a monster effect: You can send 1 other face-up “Altergeist” card you control to the GY; Negate the activation, and if you do, destroy it. You can only use this effect of “Altergeist Protocol” once per turn. I mean, we couldn’t go without reviewing one of the Altergeist Traps, so I felt Altergeist Protocol was the best choice. Altergeist Protocol is a Continuous Trap that prevents the activation and effects of your Altergeist cards from being negated. Nice to keep your Altergeists safe from those pesky Solemn Strikes or Ash Blossoms or whatever, I assume it protects them from Skill Drain as well, but don’t quote me on that, I’m sure it works with Ash Blossom since she negates the effect despite not negating the activation. When your opponent activates a monster effect, you can send 1 Altergeist card you control to the graveyard to negate the activation and destroy that card. The only thing that kinda stings here is you can’t use Manifestation chained to the monster effect and then use Protocol since the Manifestation will interrupt the chain since it can revive a monster without being on the field upon resolution since it would equip itself to the Altergeist. Still, Protocol is a great Trap in the deck. I don’t think it needs saying as to why again, but the best options to send would be Meluseek or extra copies of Silquotous that you control, but sending a Multifaker you control can be nice to revive later with Manifestation for its effect. You can only use the latter effect of Protocol once per turn cause I guess they don’t want you negating too many cards, but that’s fine since Solemn Strike or Infinite Imperemance could fit in well in Altergeist since they are Traps. Protocol is one of the better Traps in the deck, two or three work since Marionetter can set it directly from the deck and Hexstia can search for it if need be. Art: 4.5/5 Be careful about going towards the light. Altergeist Protocol is a logical step for review as this week progresses. This is a Continuous Trap, which starts with a very useful and powerful effect, in that the activation and effects of Altergeist cards can’t be negated. That play great in the Deck (amazingly awesome with Hexstia) that we just looked at yesterday, and makes the Deck that much more dangerous. Austin touched on if this would protect from Skill Drain (and after a quick google) it does, so add that to your knowledge arsenal. There’s also MORE negation and destruction here (because this Deck doesn’t have enough of that) where when your opponent activates a Monster effect, by Tributing an Altergeist you control (face-up), you negate the activation of said effect (and if successful) destroy that card. That’s, naturally, once per turn, but with all the power and protection we already get from this Trap, that’s definitely a necessity in my eyes. It can be searched and set from the Deck (remember the review of Marionetter from Monday) and it gives this card more power with that too. This, like yesterday, is a card worthy of being played in multiples also. Art: 3.5/5 It’s not quite as pretty as the previous two, but the light and darkness contrast is still going, and I like the glowing on the bottom half of the body.